The Advocacy NetworkAdvocacy BlogDemographicsWells Fargo; Perfect Example! So, we have been screaming in a sea of disinterest. That message has been loud and clear about the greatest financial risk facing all Americans today. The risk you, your loved ones and all your acquaintances are exposed to is financial victimization. Who exactly can you trust? The recent Wells Fargo debacle simply reinforces our message. If you go to Wells Fargo website you will actually find information on scam protection, they discuss phishing emails and other internet based scams. Yet they had their own employees fraudulently opening phony accounts. Kindly consider that this is a major banking institution who obviously had no control over their employees. Not only did the bank fail to protect depositors it failed miserably in any form of security compliance. This is not the usual breach of information where you get an apology letter about your personal information being pierced. Those are funny letters by the way, when the institution actually offers to pay for your subscription to an identity theft protection service after the institution left your personal information unprotected for hackers. No, this is actually the bank taking your personal information and opening phony accounts under which the employees and the bank accessed fees from you. This is more then financial victimization it is s direct breach of trust from a full fiduciary relationship. Under the fiduciary relationship Wells Fargo has the 100% responsibility to protect YOUR best interest in every transaction they touch. Now, let me ask you the obvious question: Who can YOU Trust? This is the wake up call the Advocacy Network has been sounding the alarm on for almost 5 years now. YOUR exposure to financial victimization exists in every financial decision you make. There is no safety net around you. YOUR bank takes no accountability for the integrity and safety of your personal information and identity. Bad enough they charge ridiculous fees simply as depository for your money, now they also are willing to run scams that take fees fraudulently. One of the creepiest things that can happen to you is to have your bank or credit card company open an account in your name without you knowing it. Well, guess what: That’s exactly what Wells Fargo did 2 million times to its customers. The Consumer Financial Protection Bureau and the Office of the Comptroller of the Currency, in all their pride and glory, announced a $185 million settlement with the bank. For its part, Wells fired 5,300 workers — but not a single executive from the C-suite. As if these workers conspired among themselves, with no direction from above to work this fraud. These are regular, middle-class people, probably making about $35,000 to $75,000 per year with families and bills to take care of. But Carrie Tolstedt, the head of Wells Fargo’s Community Banking division where those 5,300 people toiled, will be retiring with a $125 million compensation package. And what do we hear from Wells Fargo’s largest shareholder? Crickets. That shareholder is Warren Buffett, who owns some 470 million shares, a 9.5 percent stake. 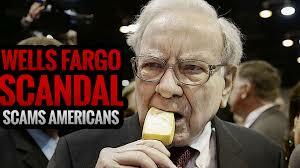 Buffett — who often calls for transparency and accountability — has been deafeningly silent. Wells Fargo and Buffett are cut from the same cloth. Both hide behind and benefit from a folksy but fake next-door neighbor image, while they are actually sharks in the kiddie pool. That the CFPB allowed Wells to neither admit nor deny wrongdoing for a widespread fraud is bizarre. Also bizarre: That thousands of employees partook in digital signature fraud in order to open phony accounts that customers never even knew of. The regulators should have demanded that the head of the bank’s regulatory oversight team be fired. In addition, the CFPB should have given all the money it “fined” Wells Fargo to affected customers, who must be feeling pretty violated right now. And if Buffett cares about his image, he should call for senior management resignations — without the $100 million severance packages. Hopefully everyone now can clearly understand our message. The Advocacy Network has been spreading the message about the risks of financial victimization. We are a trusted source whose efforts have saved our members over $6M to date. Our simple solution through membership is fully accountable to proactively protecting our members from all forms of scams, fraud and predatory sales tactics. There is no more secret or misunderstanding, the white elephant in the room is financial victimization and if you can no longer trust simple banking then the exposure has now become a canyon of risk. There is a simple solution for this exposure, for about 65 cents a day the Advocacy Network will provide you the necessary protection 24/7. Don’t be financially victimized, become a member today!